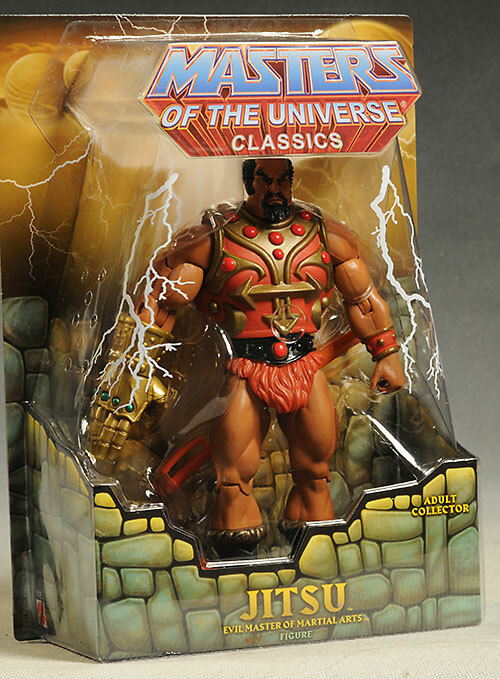 Even after years of Masters of the Universe Classics, they still haven't made it through all the original figures. 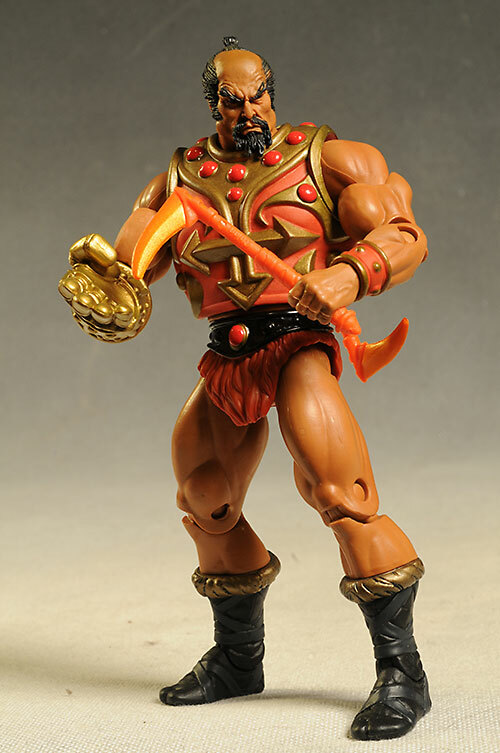 But they got one step closure in February with the release of Jitsu, Evil Master of Martial Arts! This new version has some key retro aspects, as well as several cool weapons. He wasn't cheap - at $27 each, none of the regular 2013 figures could be called cheap - but he is likely to be a must have for most fans of the original series. After this many years and this many figures, it's tough to come up with anything original to say. If you like the past packages, you'll be happy. If you're the sort of MOCer that likes consistency in his display, you'll be happy. Don't care about what the package looks like - move along, nothing to see here. I really do like almost every aspect of the sculpt on this figure. 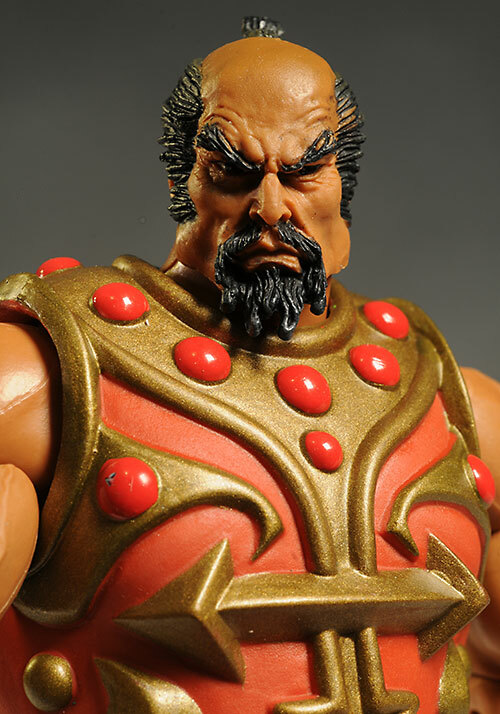 It starts with the cool head sculpt, with just the right amount of evil determination in the grimacing expression. Everything is sharply defined, including the hair. The head does seem just a smidge small to me, but that might be more my interpretation than reality. The sculpted armor adds nothing but positives to the overall look. The design is cut deeply into the metallic looking chest plate, with sharp edges on the raised sections. It restricts the ab-crunch, but that's a small price to pay. Finally, he has that groovy armored right hand, sculpted in a knife hand pose. I'm not thrilled that he can't hold anything in this hand, but that's a minor nit when compared to the cool detail on his right hand of karate doom. My only nit here is how hard the plastic is used for the left hand. It's very difficult to get the sword into the hand because of it. The paint is quite clean, and there's some very nice detail work. The facial hair has a good cut line, and even the tiny eyes are sharp. I particularly like the work on the armor once again in this category. 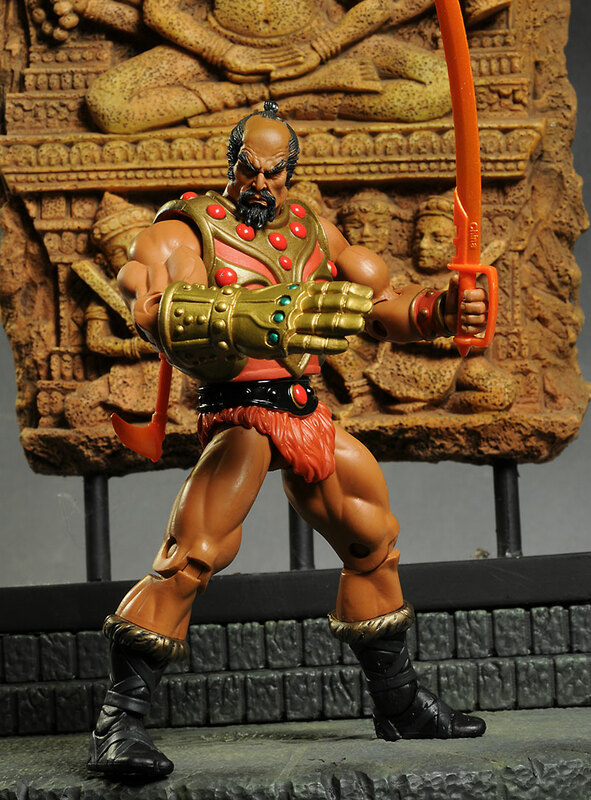 The bronze color is very realistic, and the use of red makes his outfit pop visually. The darker bronze is offset by the bright gold armored left hand, and by using two such distinct colors, it's clear to the viewer that they are not suppose to be the same material. The only negative is the lack of ops on the weapons, and a slight difference in the skin tone between the body and the face. 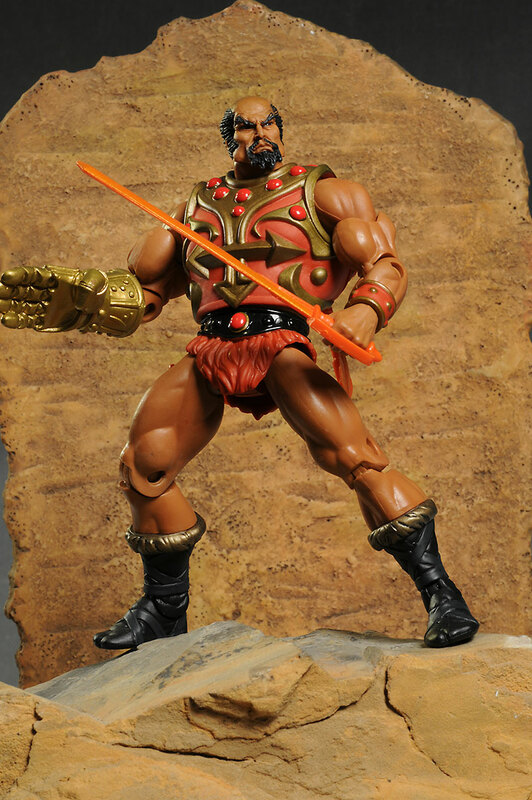 He has all the usual MOTUC articulation, including the ball jointed neck, ball jointed shoulders and hips, pin elbows, knees and ankles, and cut calves, biceps, waist and wrists. Most of the joints work well, although some are very tight. The hands aren't soft rubber this time around - as I mentioned earlier, the left hand is so hard it's almost impossible to get the sword hilt in place. On the plus side, that means they turn without fear of ripping the post. There's also the usual ab-crunch, but it's pretty much made moot by the armor. The figure comes with three accessories, but unfortunately, none are an alternate portrait. You know how much I love those extra heads, but this isn't a character that lends himself to that. Instead, they gave him three weapons - a Samurai sword and two Kama swords. You know the ones - they look like funky axes. While the sculpts are good on all three, there's no paint ops. They are cast in a orange/red color, and that's what you get. The back of his armor is designed to hold the three weapons - the handles of the two Kama swords fit inside the loops, and the blade of the larger sword can fit in the slots in the center. I'm not sure it's suppose to, but it does. The smaller swords are most certainly intended to fit in the loops, but the blades end up in a very dangerous spot. It looks good, but is definitely not realistic. This line remains a terrific series of toys, even by today's standards. There aren't many figures on the pegs right now getting this same level of care and quality - other than TMNT, the pickings are pretty slim at the local store. I'm still not happy with the higher price point of $27. That's an awful lot of money for a figure like this - easily twice what it's worth to most people. Production numbers are probably down in 2013, so some increase is probably understandable, but this is still a painful pill to swallow. 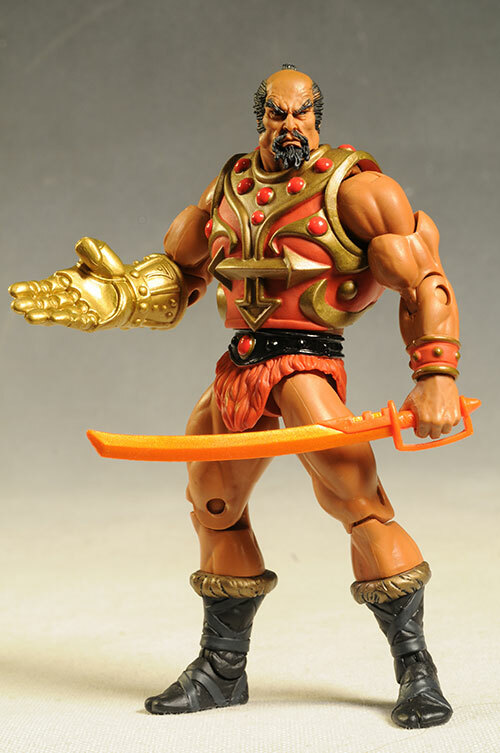 I had a few nits with this figure that held it back from a perfect score for me - that hard left hand makes it tough to swap accessories, I'm not thrilled with the way the swords attach at the back, and the slight difference in skin tone between head and body bugged me. All that said, this is still a very good addition to the series, and has far more positives than negatives. I like the combination of Samurai style and metal hand, a traditional concept that's been executed well here. Matty Collector was the best place to pick him up, but now your options are a bit more limited. Most recent was Ram Man, who came out at the same time as Jitsu. Before that, I covered Mosquitor. Just before that was the cool Castle Grayskullman. - also check out Rattlor, Mekaneck, Sir Laser-Lot, and before that we had the cool Griffin, Slushhead, the excellent Draego, Kobra Khan, Sorceress, Demo-man, Fearless Photog, Snout Spou, Wind Raider, the large Megator, the giant Tytus. 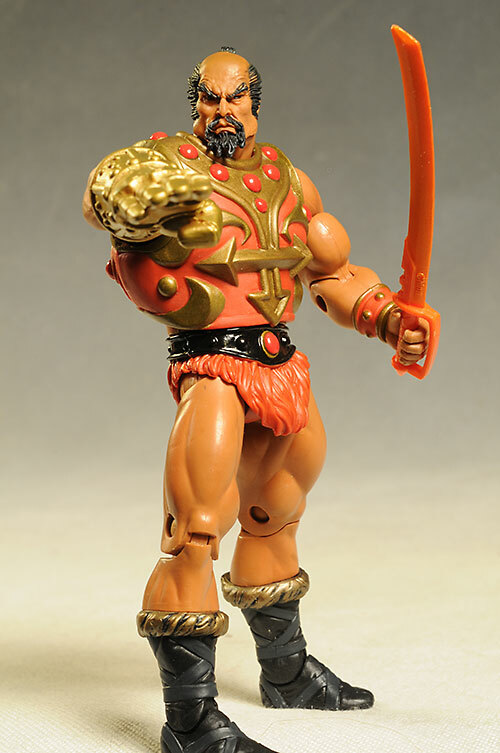 Leech, Icarius, Clawful, the Faceless One, Catra, Sy-Klone, King Hssss, Vikor, Buzz Off, Grizzlor, Roboto, Gygor, Chief Carnivus, Whiplash, Orko, Count Marzo, She-Ra, Optikk, Evil-Lyn, Moss Man, Trap Jaw, Adora, Scare glow, Teela, Man-at-arms, Hordak, Zodac, Faker, Mer-man, Stratos, Webstor, Tri-klops, and starting out with He-man, Skeletor and Beastman together in one review. - I also covered Battle Cat and Panthor, the big kitties. 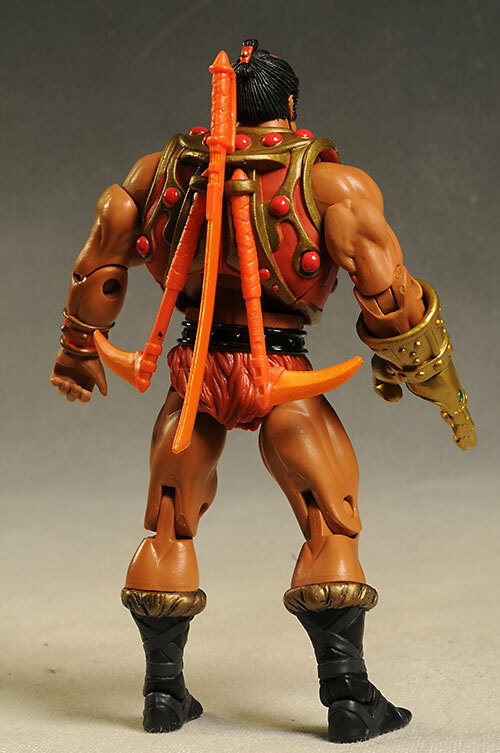 - check out the cool MOTUC Display stands. - I've also looked at more weapons recently.the cool custom swords and shields you can get from SpyMonkey Creations.